Star art director Sabu Cyril was to direct Ananthabhadram last year. The film was based on a novel that won last year's Malayala Manorama weekly award. 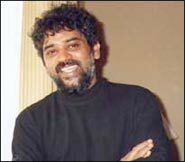 Now, Sabu has stepped down, and internationally acclaimed cinematographer and director (The Terrorist) Santosh Sivan (left) has taken over the reins. At that time, Sabu had said, "The novel is on superstitions, black magic, etc. But what I liked was the background. So I decided to weave a love story into it. It is about a young man from Mumbai, who was forced to come to a village to immerse the ashes of his mother. The story is about how he gets entangled in the happenings in the village." He would have finished the film last June if not for the strike in the Malayalam film industry. By then, he got busy with Shankar's Anniyan. Now, he has taken up Priyadarshan's new Hindi film, starring John Abraham. Timberlake plays Bruce Willis' son! Just before taking a flight, Sabu told rediff.com, "The producer asked me whether they could ask somebody else to do the film. I am happy Santosh is doing the film. The film is my baby, and I had kept everything ready; we had to only start shooting. I am happy my baby is in safe hands. Santosh asked me whether I had any problem in his doing the film. I said I was happy. We are regularly in touch. When he wanted some changes in the script and scenes, he checked with me." Sivan has left for Kerala after shooting the last portions of Mistress Of Spices in the US, starring Aishwarya Rai. He also recently finished a Tamil film called Navarasa. Ananthabhadram stars Prithviraj and Kavya Madhavan. Sabu had wanted Meera Jasmine but she was busy with her Telugu movie commitments. Though Malayalis, both Kaveri and Surya Kiran are part of the Telugu film industry. Kaveri, a well known actress in the Telugu film industry, is better known as Kalyani there. Other than her roles as a child artiste in Malayalam films, her role as a deaf sister in Vaasanthiyum Lakhsmiyum Pinne Jnanum was much appreciated. Unfortunately, Malayalam cinema ignored her. So the Telugu film industry accepted her. Surya Kiran, known as Master Suresh earlier, won a National Award as a child artiste. He had acted as Mohanlal's and Mammootty's son in many films in the early 1980s, and also portrayed the childhood days of Rajnikanth and Chiranjeevi in Tamil and Telugu movies. As an adult, he bid goodbye to acting and turned to direction. Surya Kiran's most successful film is Satyam, which he directed for Nagarjuna to relaunch his nephew, Sumanth. Kaveri and Surya Kiran met on the sets of a film, but it was not just love that blossomed into marriage, Kaveri insists. It was an arranged marriage in which love also played a part, she says. The wedding will be held at Thiruvananthapuram on May 1. An offbeat film made on a shoe string budget by National Award-winning director Jayaraj, Makalkku has been much appreciated by those who love serious cinema. Shobhana portrays a mentally deranged woman who speaks only one word in the entire film, killeri. Those who attended the 25th day celebration were Jayaraj, Shobhana, Rajan Poduval and psychiatrist Dr M R R Menon. The story is based on a real life case treated by Dr Menon and brought to public notice as a photofeature by Poduval. Next, Jayaraj will direct the sequel to his most successful commercial film 4 The People. The sequel is titled By The People. Upcoming actor Sunil plays the lead. Sukanya has been a well known actress having made her debut in Bharathiraja's Pudhu Nellu Pudhu Naathu. Some of her successful films were Chinna Gownder and Walter Vetrivel. Now, she has turned lyricist and composer and has just released her debut album Azhagu. Sukanya, who was a trained classical dancer from the famous Kalakshetra Academy in Chennai, had all the big names in the music industry lending their voices for her album, including S P Balasubramanyam, Chitra, S Janaki, Nityasree Mahadevan, Srinivas, Karthik, Sriram and Harish Raghavendra.